Kaia Gerber is the hottest new thing on the block and the fashion industry continues to embrace the daughter of modeling royalty Cindy Crawford. She’s already been on the cover of Vogue Paris, posed before the lens of the legendary Steven Meisel, done an advertising campaign for Alexander Wang and now takes to the cover of POP — her first big solo blue-chip magazine cover. Complete with a very evident concept referencing back to her mom’s modeling heyday, Kaia participated in an 80s-inspired cover shoot by Charlotte Wales and we’re loving it. 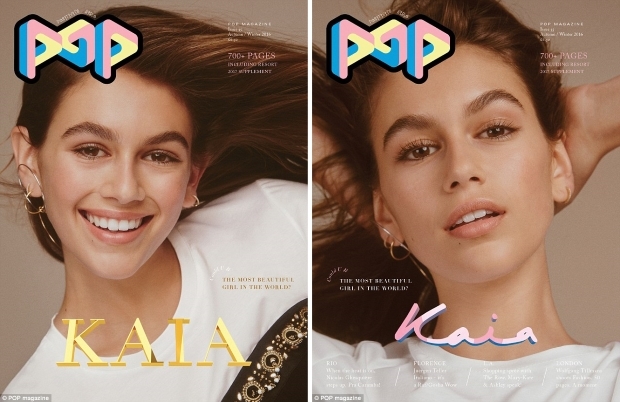 Serving up a trio of youthful covers and a lengthy fashion spread to seal the deal, Kaia’s a welcome sight if you ask us. Members of our forums were delighted. “She needs to work on her modeling but she’s miles ahead of Kendall already and there’s no doubt she is going to blossom into a beautiful young lady. She truly is her mother’s daughter, the resemblance is uncanny in some of those pics,” said marsnoop2 straight away. “So stunning! This is what a Vogue Paris cover should be like TBH,” championed JoCaderone. “Oh, this is too gorgeous…” sighed Avogadro. In the same frame of mind was jeffandtheworld. “Aw! It is really sweet that they paid homage to her mother and the 80s poses. Very warm and attractive covers – first and third are my favourites!” he announced. “Wow, this is actually lovely! I guess she does have more potential than Kendall and the likes indeed,” raved dodencebt. But not everyone thought Kaia was a welcome sight. “She’s a pretty girl, but she’s 14 and already getting this much exposure. It gives me the impression that whoever is handling her is just waiting for her to be ‘legal’ so they can go into overdrive and really push her as a modelling product,” stated tigerrouge. “She’s just a teenager. She looks like a teenager, she’s cute like a lot of teenage girls and that’s about it. I do not want a picture of a young teenager on my coffee table,” wrote a disapproving Les_Sucettes. See more from Kaia’s cover shoot and join the conversation here.